Some of the new-media digirati have been having fun at the expense of First Look Media founder Pierre Omidyar, because the new company persists in describing its new family of media sites — including the just-launched Intercept from Glenn Greenwald — as “digital magazines.” Not only does the idea of a magazine seem almost antiquated by now, but most of the examples of the digital version are bloated proprietary apps from old-media standards like Vanity Fair and Time. But while the magazine metaphor doesn’t quite work, there is something to the approach that First Look seems to be taking, although it’s difficult to tell for sure because the new company has only launched one. But my sense is that by “magazine,” they just mean a discrete publication focused on one single topic or issue, run by journalists who have some passion for the issue. And that’s not dumb at all — in fact, just the opposite. 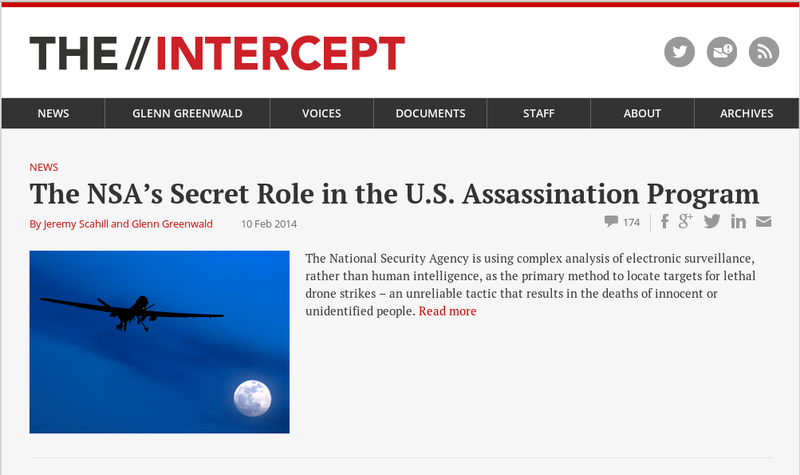 Take a look at The Intercept: as the new site describes it, the team of writers and editors devoted to the project (which includes Greenwald, former Washington Post writer Jeremy Scahill and film-maker Laura Poitras) will be focusing on security issues, and primarily — not surprisingly — on the ongoing revelations from NSA leaker Edward Snowden. If that’s a magazine, it’s more like a trade publication aimed at an audience interested in security and privacy. @amichel Mini-sites on a theme, led by journalists with a point of view and subject matter expertise, drawing off a common core of services. This kind of focus on a topic or vertical has already been shown to be a fairly smart strategy, by outlets as varied as The Atlantic, Wirecutter, Skift (which covers travel), and even some old-fashioned names like the Washington Post and the New York Times. The Atlantic, for example, didn’t just add coverage of cities to its existing site — it created a specific vertical called Atlantic Cities. And it did the same thing for real-time news aggregation with The Wire. The magazine, which has been one of the most prominent success stories when it comes to an old media entity reinventing itself for the digital age, doubled down on this approach when it launched a new standalone site called Quartz, which focuses on real-time business news. According to a recent report from Quartz, it has been able to draw more than 5 million uniques in a little over a year. Then there are the targeted verticals that have been created within existing media sites like the New York Times and Washington Post: the latter’s Wonkblog became such a successful empire within the newspaper that it gave founder Ezra Klein enough pull to cut his own deal with Vox Media. Andrew Ross Sorkin’s DealBook fills a similar type of niche at the NYT, as does the Bits blog to a lesser extent. Either one could arguably become a standalone site, much like All Things Digital (now Re/code) was for the Wall Street Journal. In a recent rundown of the new-media sites that he sees as the best in their class, venture capitalist Marc Andreessen listed The Atlantic for “taking a long-lived and respected brand and blowing it out worldwide,” along with several topic-focused sites including The Wirecutter and The Verge, which is a tech-focused site run by Vox Media. Former Gizmodo editor Brian Lam founded The Wirecutter as a recommendation site for all different kinds of products. Jay Rosen, an NYU journalism professor who is also an advisor to First Look Media, pulled together his own list of what he calls “personal franchise model” sites, which includes DealBook, Grantland and Jessica Lessin’s new site The Information, which is focused on business news. As he points out, the model is not new: pioneering journalist I.F. Stone had a newsletter that used the same approach in the 1950s. Andreessen also cited Anandtech — which focuses exclusively on security and software topics — as well as Search Engine Land from Danny Sullivan, which covers everything related to Google and search, and Politico (started by former Washington Post staffers). Although he didn’t mention it, Skift (which was founded by Rafat Ali, the founder of our former sister site paidContent) is pursuing much the same model aimed at reporting on and analyzing the travel industry. Others who arguably fit the same model would be Mike Masnick’s TechDirt, which covers technology and related topics such as copyright, and Josh Marshall’s Talking Points Memo. Business Insider also fit the model, at least in its early days when it focused exclusively on business — although of late it has been expanding into various parts of pop culture (Andreessen said he is an investor in both Business Insider and Talking Points Memo). One thing that’s particularly interesting about this model is that it makes it much easier to build a strong relationship with a reader community, which is one of the secrets to success for TPM and TechDirt — both of whom have a community-focused approach. Targeted a specific vertical makes it much easier to connect with a community that is passionate about the same thing, and that could be one of the biggest benefits for First Look as it expands. I think you’re not going far enough here. The old style journalism that involved large media outlets disseminating generalized news to people cannot cope with current day issues even if it wasn’t obsessed with reporting breaking news as quickly as possible. The world is just getting too complicated. Who really understands the subtleties of the healthcare bill and how it will REALLY affect people? Who actually understands the basics of how fracking works? Who understands why companies like Facebook find your personal data so valuable? Who understands the dangers of GMO foods? What westerners actually understand the cultural complexities of the Syrian civil war? You need to be an expert in these concepts to have meaningful conversations. That’s why we need explanatory journalism to bring in experts to explain these concepts in a somewhat long form fashion to the average/above average person. We cannot advance as a society if explanatory journalism doesn’t become more prominent, because no one making the decisions and voting will have a clue what’s going on. Why not call it the Daily Planet? In terms of digital replica of traditional magazines the term â€œdigital magazinesâ€ is very accurate. This is what we actually do in PressPad . Coming back to First Look Media their claim to reimagine journalism for the digital age is awesome and I wish them good luck! Why not call it “First Look: Paper”? Is everything taken? FirstLook is and has been National Cinemedia’s long-running pre-show before the movies [hand to shaking head]. You have selected a very thoughtful title.